Out with the old, in with the new! 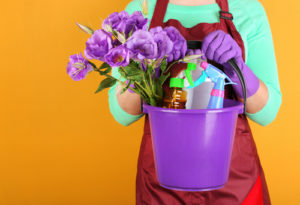 Spring is a time to start fresh, so premium cleaning service Redondo Beach has composed an amazing and helpful spring cleaning checklist to make the process go faster. Your home will benefit from spring cleaning, and so will you, as you make some extra room, clear your mind and realize that less really is more. Once you’re done, you’ll want to show off your ideally clean and tidy home to all your friends. After all, completing a full-on spring cleaning project calls for a celebration! Not only will a well-thought-out preparation for this massive undertaking save you time and energy, but also help you be more decisive. Haven’t worn a T-shirt in over a year? Give it away or repurpose it. Get some boxes, categorize and subcategorize. Overthinking what stays and what goes only creates a vicious circle. Once you start decluttering like you mean it, you’ll find yourself astonished at how much of the stuff you own is totally redundant. Cleaners must be good and ready. You’ll need to do some extensive vacuuming, so make sure your vacuum cleaner is perfectly clean itself, ready to tackle every single speck of dust in your home. As for cleaning supplies, don’t let yourself get distracted by too many choices – stick to the essentials. Don’t forget a disinfectant so you’ll know you’ve done an utterly thorough job. Finally, any helpers (household members or friends) must be completely up to the task. In other words, if they can’t stand the heat, they’ll just be getting in the way. Cleaning household appliances – the dishwasher, the washing machine, the fridge and other household appliances must be squeaky clean so as to operate more efficiently. De-gunk the kitchen – every element of your kitchen could, ironically, be the greasiest and germiest. Get scrubbing! Thorough dusting and vacuuming – your vacuum cleaner is your must-trusted ally in this endeavor, as you’ll literally need to vacuum everything (even the ceilings and light fixtures). However, it might be wise to have a professional deep clean the carpets and upholstery. As for the curtains and rugs, they can go in the washer. Make those floors shine – microfiber cloth and a strong cleaning solution is all you need to make floors perfectly spotless and looking beautiful. Remove dust and debris from vents – this is not only about cleanliness, but also about energy efficiency and overall health. Clean the plumbing – spring is also a time to clean the often neglected drains and get rid of those nasty odors. Make the bathroom spotless – apply a cleaner to the grout and tiles, scrub with a brush and rinse. Once all the bathroom elements are absolutely stain-free, you’ll thank yourself. Time for spring cleaning? Cleaning service Redondo Beach rushes to your aid! For your home to wake up from its winter sleep looking splendid, and stay neat and tidy after the spring cleaning is done, you’ll need a helping hand. MaidThis offers impeccable cleaning service Redondo Beach so you can enjoy your home in all its glory this spring. Give us a call and let us wow you!